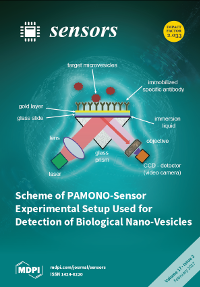 The most recent B2-Project publication "Application of the PAMONO-sensor for Quantification of Microvesicles and Determination of Nano-particle Size Distribution" has been selected by the journal Sensors as the leading article for their current issue. The article is available via Open Access on the journals web site. The article was co-authored by Alexander Schramm, project leader of SFB-project C1. The PAMONO-sensor (plasmon assisted microscopy of nano-objects) demonstrated an ability to detect and quantify individual viruses and virus-like particles. However, another group of biological vesicles—microvesicles (100–1000 nm)—also attracts growing interest as biomarkers of different pathologies and needs development of novel techniques for characterization. This work shows the applicability of a PAMONO-sensor for selective detection of microvesicles in aquatic samples. The sensor permits comparison of relative concentrations of microvesicles between samples. We also study a possibility of repeated use of a sensor chip after elution of the microvesicle capturing layer. Moreover, we improve the detection features of the PAMONO-sensor. The detection process utilizes novel machine learning techniques on the sensor image data to estimate particle size distributions of nano-particles in polydisperse samples. Altogether, our ﬁndings expand analytical features and the application ﬁeld of the PAMONO-sensor. They can also serve for a maturation of diagnostic tools based on the PAMONO-sensor platform.